I love to make soup on Sunday and take it with me to work for the week as lunch. I have tons of basil in my garden that I never know what to do with. Great idea! My thoughts excatly! I had a huge basil plant on my porch that needed to have leaves plucked! Sounds delicious! I can’t wait to make this one, Helen! It sounds like it would also be tasty chilled on a hot day! In that case… I would add some chopped walnuts if you serve it cold… or maybe even some some salted chopped macadamia nuts! That looks delicious! nice presentation too! I love zucchini so I might as I well cook that soup either tonight or tomorrow. With bountiful zucchini growing in my garden I will be canning zucchini in all ways possible in summer of 2012. Have you ever made this soup and pressured canned it? This recipe seems really good and I would love to attempt to can it. 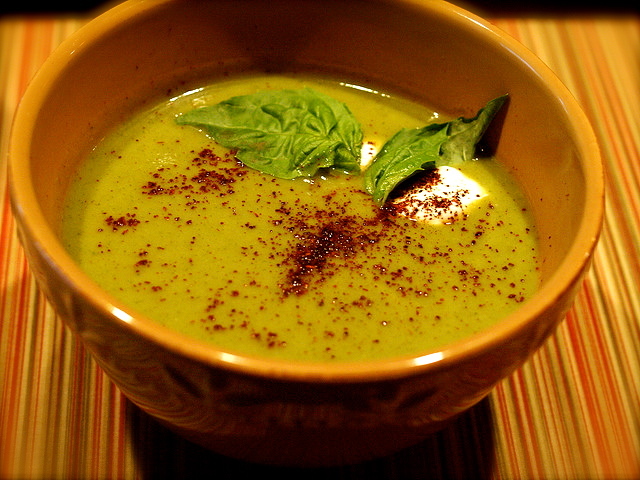 I am making some zucchini soup this afternoon…thanks for the inspiration!